Small groups at Fishers is where we grow in the new life we have from Jesus and share life with one another. We welcome you to join a small group with us! Some meet weekly, others monthly. Some groups have a common link (young families with kids, empty nesters, etc.) while others have a mix of life stages who live in the same general area. This group of ladies meets every Wednesday morning from 9:15 - 10:30 a.m. in Room 209. We are currently studying "The Cross." Breakfast, Bible study and fellowship led by James Loesch. Tuesdays 6:30am-7:30am at Chick-Fil A on Hwy 6 & 59. Currently studying Acts. Women's Group meets 2nd and 4th Thursday Evenings at 6:45pm. Studying an Introductory course to the Psalms. Snacks are provided. Handmade quilts for Lutheran World Relief. Knitters & Crocheters make Prayer Shawls & Baby Blankets. Meets every Tuesday from 9:30am-11:30am. 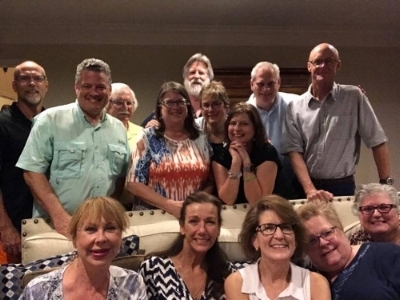 We meet every Monday night at 7:00 p.m. in the Church Gathering area or members' homes as the host/hostess wishes, and they provide light refreshments/dessert for the month of their choice. Although our names says couples we are not all couples and we are open to anyone. We generally pick topics from RightNow.org listings and rotate topics as the group decides. Currently we are in the middle of an Andy Stanley study "Twisting the Truth." Meets every month for fellowship and bible study at various homes. Meets in members homes the 2nd Saturday of the month. Currently studying Aging in the Grace of God. Meet at 6:30pm rotate to each month to member's homes.- Hosting is strictly voluntary. Members provide Appetizers and Dessert. "havin fun, workin hard and tryin ta get to Heaven" Home Bible Study with hors d'oeuvres & dessert on the 2nd Saturday of every month. This small group rotates homes and is currently studying the Minor Prophets. All ages welcome. This small group meets on the 4th Friday of every month at host homes in the area. They are currently using Ray Vander Laan's study of the Holy Land, "At the Crossroads." 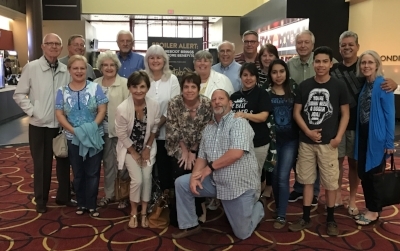 Fishers Senior Adult group...new friends are always welcome! Meet on Tuesday afternoons at 12:30pm to play Mexican train. The second Tuesday of every month we have various activities, tour local venues, or have such at area restaurants or potluck luncheons at 11:30am. We are a small group for young couples & families in the Missouri City/Sienna area. We meet twice a month on Fridays at 6:30 p.m. at host homes. Kids are welcome! We are currently studying "A Life Time Love” by Gary Thomas and we use Right Now media for the video portion of the study. This group provides parents (married or single) of middle schoolers and/or high schoolers a chance to have fun, have fellowship, encourage one another, learn from one another and from God, as we get in His Word for wisdom in experiencing & addressing the variety of circumstances we all encounter on a bi-monthly basis.